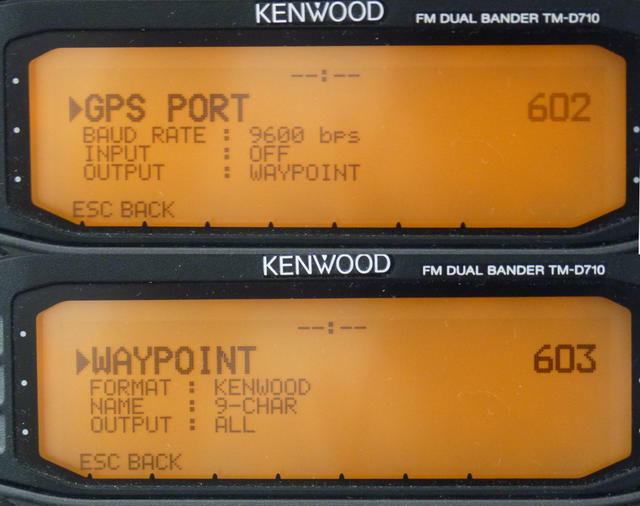 It is possible to use APRSdroid as the GPS receiver for a Kenwood D7x0 mobile rig. This way, you do not need a dedicated GPS receiver, and you can configure the rig to display received positions on the Android device. To connect the two, you will need a Bluetooth RS232 adapter that you can connect to the D7x0 GPS port (2.5mm at the side of the control unit). However, APRSdroid will only display information. Own position beacons, Messaging and other APRS functions will not work from APRSdroid. 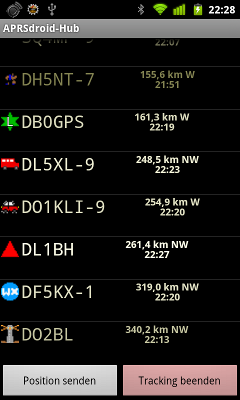 The displayed information only consists of callsigns and positions (you can use the map in that way). You need to set Connection Type to Kenwood GPS port and configure the correct Bluetooth device in the Android preferences. Please also set Position Source to SmartBeaconing (or to Periodic GPS Position with "High (always on)" GPS precision). This is required to keep permanent GPS reception for the D7x0. It was also reported that the FTM-350 transceiver supports APRSdroid in its "waypoint" mode.